Brand new with tags onezie with a bib and shorts size 3-6M. From Dollar General. Disney brand. Very cute brown three piece Disney outfit. Includes hooded jacket, pants and long sleeved onesie shirt. Jacket and pants are polyester and striped shirt is cotton. Jacket is hooded, has a front zipper and embroidered Mickey Mouse and other outdoor scenery. Boys Toddler Shirt & Pants & Bib Outfit. 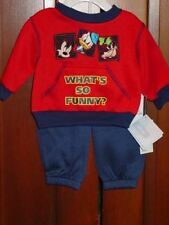 DISNEY- BABY/INFANT-BOYS-SIZE "3/6 M" PREMIUM-ORANGE SHIRT & PANTS & BIB-OUTFIT Simply Exquisite. DISNEY Make Outfits, Not Just Any Outfits. Real Good Ones! 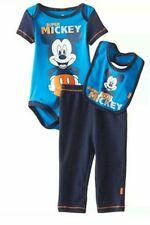 Mickey Mouse boys 3-piece set: Set includes one creeper one bib and a sleeper. Style: Short Sleeve Mickey Mouse Short Set. Size: 3/6 Months. Care: Machine Washable. I don't have a set. Color: Blue, Red, White, Gray, Black & Beige. If any problems.